When Captain America and others are in Lagos, preventing a biological pandemic, innocent bystanders are killed, which results in over 100 countries coming together to limit the activities of the superheroes . Cap and others wish to remain independent while Iron Man, War Machine and friends want to go along with the new accord. Meanwhile a rogue former Russian agent reactivates the Winter Soldier for reasons of his own. 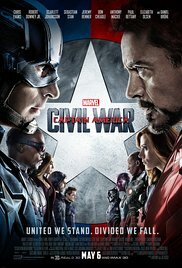 The superheroes fight each other, meanwhile Cap must deal with the Winter Soldier, otherwise his friend, Bucky Barnes. Starting with the battle in Lagos, almost continuous set pieces of one sort or another, particularly cars chasing motor bikes, motor bikes chasing cars and hand to hand fighting, culminating in the great superhero confrontation in the airport where the two groups fight each other. Now and again people are restrained in one way or another and the US Secretary of State negotiates, particularly with Iron Man. There are visits to the “Raft” a prison out in the Atlantic where superheroes can be held. There is almost nothing to offend here, although some of it is quite violent. A View I quite enjoyed the first two Captain America films, but was unprepared for this ensemble superhero outing. Honestly I can never suspend my disbelief sufficiently to accept that, for instance, a man who has developed a special high tech suit can exist in the same universe as a woman who can carry out complex physical tasks with her mind. So I am with the minority of crtics who did not enjoy this much, but the rest of you, if you decide to watch this, you know what you’re getting into. Source of story Apparently a 2006 Marvel Comic – Civil War. Additional Info This is the third Captain America film and the 13th MCU outing. The numbers say it all. It cost a massive $250 million but made $179 million on its first weekend, and eventually grossed well over $1 billion.